What is it about the warmth of a woodstove? 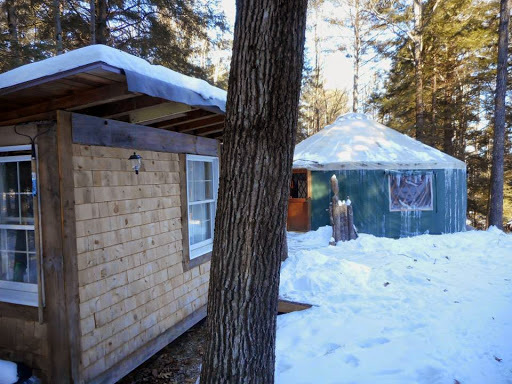 I’m sitting on a very comfortable couch, my dog Sport by my side, enjoying the quiet, in a Maine Forest Yurt. It’s minus 9 degrees outside and a very toasty 78 degrees inside, and I ask that question again. 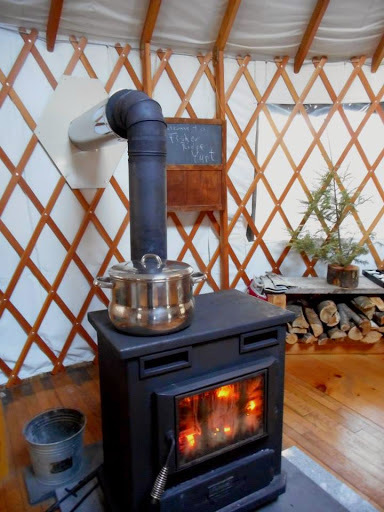 What is it about the warmth of a wood stove? I can’t nail it down, but for me, there’s nothing like it. Until I was thirty, I knew no other source of heat. I’m told when I was an infant, a sickly infant, that my folks installed a wood stove to replace a nasty furnace that blew heat up through the floor grate, along with dust particles and whatever else was lying on it. Problem solved. Oh I got sick once in a while, but nothing like before. As I sit here now, I realize you can’t replace this all- encompassing warmth. Wool mittens drying for the next round of sledding, boots warming on top of the wood box as you shake the snow off your shoulders and hat, even the splash of snow gives an all- telling sizzle as it hits the iron and welcomes you to the warmth inside. Perhaps it’s the simplicity of it, which isn’t all that simple. I can hear my mom saying, “By the time I put that piece of wood in the stove, I have it named.” I can understand why she said that, but some may not, so I’ll explain. When I was growing up we were fortunate to have 70 acres of land with hardwood, fields, wells and a brook on it up in Lovell, Maine. In late autumn, we’d fell trees, clear the branches into brush piles, cut the tree into manageable 6 to 12 foot lengths, haul them to the landing where they’d be cut into stove length, throw them into the back of the pick-up truck, drive up to the house and unload them into the dooryard where they would be split and stacked. Half a cord went onto the porch and 8 to 11 cord were stacked in the yard, bark side up so the rain would run off. If you were really lucky, you had a gas- powered wood splitter. 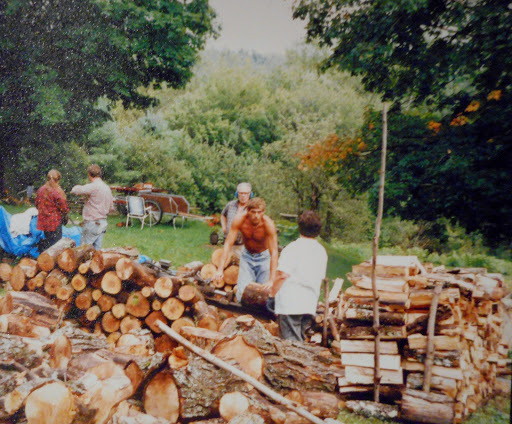 We had both going, wood splitter and a brother who liked to split a few by hand, meaning with an axe. So, you can see how my mom could have been so familiar with each piece of wood she fed into the stove that she could have given it a name. This chore wasn’t accomplished in one day either; it took several weekends with a lot of us pitching in to help. We had three wood stoves growing up, one in our house on Holly Street, and two in the old farmhouse in Maine. I never thought of myself as being “rich,” but my dad often said he was the richest man he knew. Years later, I realize why. It wasn’t because we had piles of money in the bank, we didn’t, or the fact that we had two homes. Our house was tiny, three boys to one bedroom, my sister and I in the other. The house in Maine was right out of the Beverly Hillbillies, before they made it to Hollywood. No, we didn’t have fancy real estate that only the well- off could afford, but our riches came from keeping those two homes running. The hearty breakfasts eaten together before hauling wood, the delicious stews or one- pot meals that kept us going ‘til suppertime, all lovingly prepared by Mom, who would be right there with us throwing a log onto the splitter once she took her apron off. Those times together were our riches. Summertime was no different, it was still work, but it was always fun work. I can picture my dad, lying on one hip as he weeded the garden. I’d love to hear Mom and Dad bicker during planting season, she’d be putting perennials in her flower beds and Dad would say, “You can’t eat flowers, Bev.” To which she’d reply, “Food for the soul Ed, food for the soul.” Tomatoes, they were always another subject of controversy, she’d think he was planting too many, he’d think not enough, probably because it was Mom in the kitchen putting them up for winter stews. Needless to say, we had plenty of tomatoes. When I was little-little, being the youngest of five, I can remember trying not to slip on the seaweed beds that clung to the rocks at the haul-back on the stone bridge on Goose Cove as we all filed into the dory. If it was an early low tide, Dad would row us over to Jones Creek where he’d dig clams and sea worms. 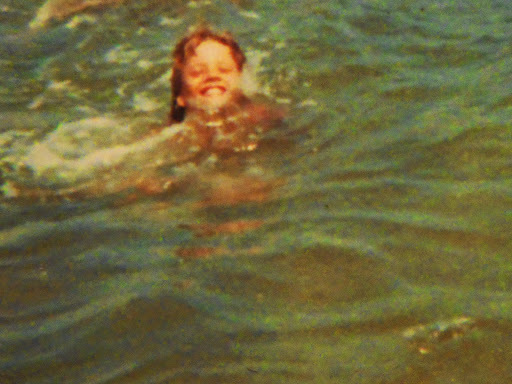 I’d get to play in the warm shallows, chasing minnows and just being a kid. Always there were peanut butter sandwiches and boy, didn’t they taste good. Which makes me think of another question… What is it about being on the water that makes you so hungry? Is it just me, or can you eat an entire cooler full of food when you’re on the water all day? Anyway, the tide would come up and we’d head over to the “Hummah,” our beautiful wooden boat that spent more time on dry docks in the Wheeler’s Point Boat Yard, than it did out on the water. My dad was a perfectionist when it came to painting her. This day, she’d be moored in Lobster Cove and we’d bait our hand lines with the sea worms Dad had dug up or bought earlier at Gleason’s. Remember those cardboard boxes of seaweed and worms? Can you still buy those in Gloucester? We’d always catch flounder to go with the steamers we’d have for supper. I’d silently hope I wouldn’t catch an eel, or they’d be on the menu too. If the day was still young enough and Dad could get the Hummah’s engine to turn over and cooperate, we’d head out onto Ipswich Bay and do some trolling for mackerel. I could have cared less if we caught anything, I just loved the warm sea splash as the boat cut through the water, maybe heading towards Crane’s Beach or the Bell Buoy. I loved looking over the rail into the green depths; maybe I’d see a whale! It was always fun. I had my own rod and reel, and my line had about six rubbery worms on it, all pretty primary colors. How excited I’d get to have two fish on the line at once. They’re truly beautiful fish, our mackerel, such vibrant colors, especially in the warm summer sunshine. Of course every day has its end. We’d head in to the mooring, tie off the boat and jump into the dory again. Then it was back to the haul-back, if I was lucky, the tide would be up high enough so I’d only have to step on the granite blocks and not have to struggle with the seaweed. If there wasn’t a lot of sun left, the “No See’ums” would eat us to frustration. We’d pile our gear into the back of the truck and head home. There we’d stand in a tiny little brook that cut through our yard and hose the salt off ourselves. When I think back, my folks must have been exhausted. They still had the chores once we got home. Unpacking the coolers, cleaning the fish, cooking the fish and steamers, melting the butter, peeling the potatoes, slicing the beets, setting the table…doing the dishes. My brothers and sister would help, but I was the little one, I got to put my pajamas on early and fall asleep right after dinner, the contented kind of sleep of a little one, who’d just spent the entire day out in the fresh air in a place and with people she loves. I bet I slept smiling. Your father was right. You were very rich. Thanks for sharing such wonderful memories. I wish that everyone could have such memories!